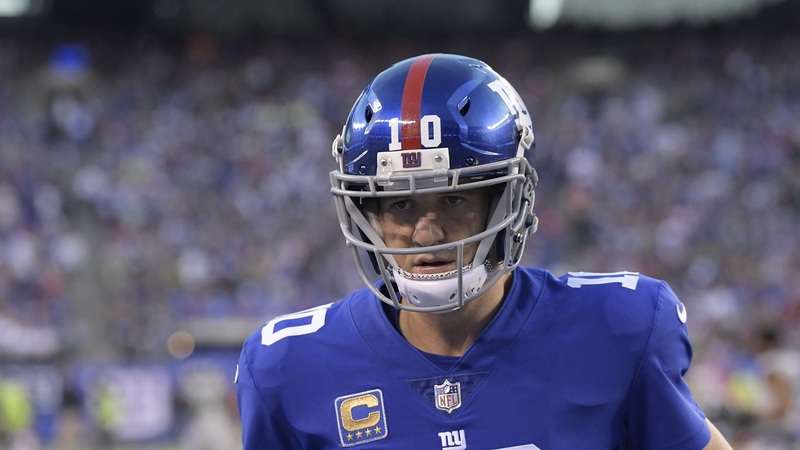 EAST RUTHERFORD, New Jersey (WABC) -- The Giants struggles continued Sunday at MetLife Stadium, as they dropped to 1-6 on the season with a 24-7 loss at the hands of the Seattle Seahawks. Head Coach Ben McAdoo summed it up by saying, "We weren't sharp on offense today." The coach went on to describe wide receivers' production in the game saying that; "We had a tough time getting them the ball, tough time getting them going." McAdoo added; "I thought we played hard, I thought we played physical but we didn't get the results we were looking for." The pass attack came into the season with great anticipation. To date, it's been a disappointment. With season ending injuries to Brandon Marshall and Odell Beckham Jr., Eli Manning's options are limited. Sterling Shepard missed his second week in a row, with no word on his return. Rookie tight end Even Engram put in a respectable performance with six receptions for 60 yards, and accounted for the teams only touchdown. This Giants team lacks receivers that could pose a threat to opposing teams. To make matters worse, with whatever receivers they do have, the offensive line is unable to give the quarterback any protection in the pocket. When asked about Manning's performance today, McAdoo said; "He's working hard, he's preparing during the week and had a tremendous week of practice. We have to get it to translate to the field on Sunday." You'd be hard pressed to find any quarterback in the NFL that can lead this team in the right direction with what the Giants put on the field on Sundays. Not to mention the lack of a running game. The Giants gained 46 yards on the ground, with Orleans Darkwa having an appalling 35 yards to lead the team. Ben McAdoo had this to say on his team's run game today; "We need to run the ball better, we need to take it into the 4th quarter in a close game with a chance to wear them out physically. The game got away from us in the 4th quarter." Defensively the Giants stood their ground for the majority of the game, but playing perfect football will eventually wear a team out. McAdoo said of his defense; "We wanted to use a variety of defensive backs, and they all played a significant role in the game." But in the end it wasn't enough to stop the Seattle offense. The Giants need to play mistake free football. Sustaining that for four quarters is a tall task for this team, despite a strong effort from the defense on Sunday. As the Giants head into their Bye Week, it's a time all teams take to heal and evaluate. That evaluation will include looking into the future, and the possibility of a top three draft pick this upcoming spring. That's something Giants fans can get excited for. Following the bye, the Giants take on the 1st place Los Angeles Rams at MetLife Stadium. Kickoff is scheduled for 1 p.m.